Worried about fillers? Show jumper Ben Maher is here to offer his advice. The best thing to do is to have fillers out in your arena all the time, even when you're not jumping them. This way, your horse will get used to seeing them. 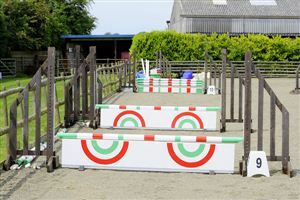 Next, try setting up small jumps with nice-looking fillers underneath. Incorporate them into your everyday routine and jump them each time you ride your horse. You don't have to do more than one at a time, and once you've jumped on, ride your horse on the flat for a few minutes to give him a breather in between. If he gets stressed this small break will give him time to take a breath and relax. Eventually your horse will jump fillers without a worry because they'll become an everyday occurrence for him.